I gained a 2:1 LLB law degree at university and currently work for one of the largest law firms in the world and I still work on the weekends. I used to think the odds are against me because of the negative associations with my community. If people ask where are you from I will name a country for fear of getting blamed for things if she gives an honest answer. Society’s stereotypes play with you head. My mother always says “Start with yourself”; I had to find who I was and feel comfortable with that. People who I like sometimes come out with ignorant comments. Should I let their prejudice and generalisations undermine our relationship, or should I challenge them and maybe lose their friendship that way. We’ve been through a lot and that is why we are such fighters. We haven’t reached our peak; if I don’t own who I am, how will children within our community have something to look up to. Law was an appropriate profession for me because I am accustomed to dealing with injustice. We are Balkan Roma; we have no country to relate to. This was not our choice; we wanted to settle, to go to school. When I brought my children up we were living in Sweden. Roma children were not allowed to go to school, but due to the work of Swedish Roma rights activists Rosa Taikon who demanded housing for families living in tents, Sweden came to lead the way. Living in the UK we everyday racism. I work in the beauty industry. A colleague said to me “You’re not a Gypsy, you’re clean and you work.” My aim is to educate people about Roma. We have 22 different languages. 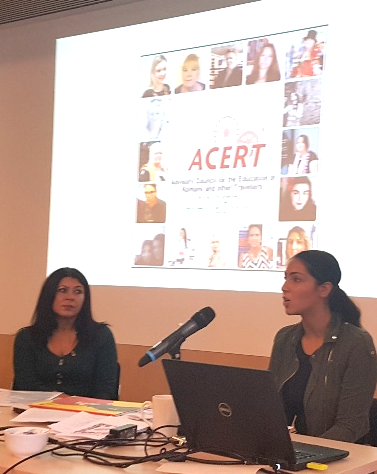 People need to be educated how to work with Roma children and families. In Hungary they burn out Roma families. There is a collective duty to educate teachers, social workers. Organisations need to work together; too often they don’t. I see other communities taking to the streets to protest; we should do the same. We need for a big demonstration. A member of the audience pointed out that there had been a demonstration but it was smaller than we would have hoped. ACERT is committed to working with other organisations, many of which are represented at this conference.